Wow, I hit California with a splash rather than a bang…flights delayed due to the awful weather and dreary wet highways to travel but, on the up side, everything is so incredibly green! And now we have been treated to several days in the row of gorgeous, calm, sun-soaked blue skies and leafy greens. Lazy spring lunchtimes while weaving with friends…a good time to look at some of the woven treasures in Martha’s collection. 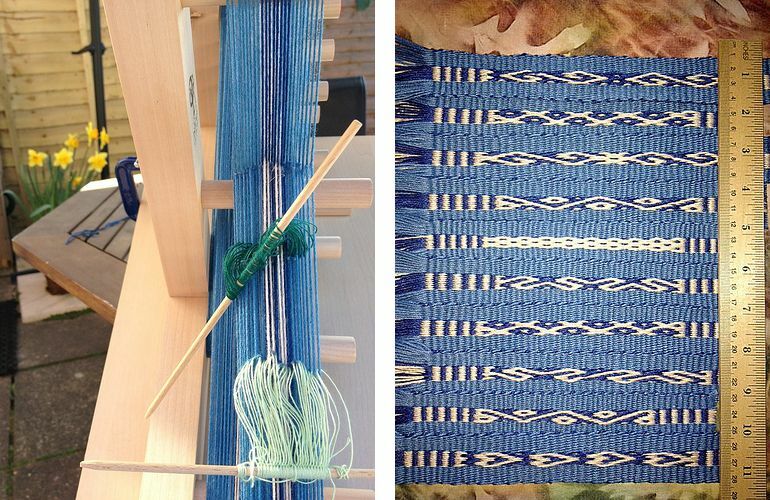 Blue skies and green – colors to inspire a new weaving? No…my mind is reeling with the mixture of bizarre and beautiful cloth I have seen in the last few days and what has jumped out to inspire me is simple black and natural white wool in a new-to-me technique…..weft substitution….more on that later. Before I left Bolivia, I was hurrying to finish up my two-color ikat experiment and practicing some “damage control” to salvage an ‘oopsy’. I dyed all three panels of my ikat warp terracotta with the cassette tape ties that you see above.. That all went beautifully. Then I added more ties to the center section of the two outer panels and dyed just those two panels dark blue…..perfect! The result was a terracotta-centered white diamond on a blue background. I wanted the reverse for the center panel and so needed to dye the center dark blue. And this is where things went wrong. I prepared a small dye solution dissolving the Dylon cold water dye in hot water, added salt and then applied it to just the center part of the warp, which was suspended over a shallow dish, with a syringe. I then let the warp sit in the shallow solution. I actually thought that I was cheating by doing this but now that I am at my friend Annie’s home, I have had a chance to read her copy of IKAT by Lydia Van Gelder and find that this is a bona fide technique that even has a name- ”spot dyeing”. In the book, the author is seen applying dye to a small section of warp with a squirt bottle. So, you can see that the damage control involved evening out the streaky blue so that the entire area would be tinted and that was the best I could do to rescue the mess. Well, that was a good lesson to learn. Other lessons learned…don’t wrap the warp in the evening in semi darkness. That accounts for some of the spottiness in the white areas from less then perfect wrapping. And I know that when I get around to making a ”real ” project in ikat, it will be worth taking extra care to make sure that the wraps are all the same length and made more precisely. I was very pleased with the weaving part. The threads stayed pretty much in alignment and I love the way the terracotta and dark blue look together. So, it is there waiting for me to come back. 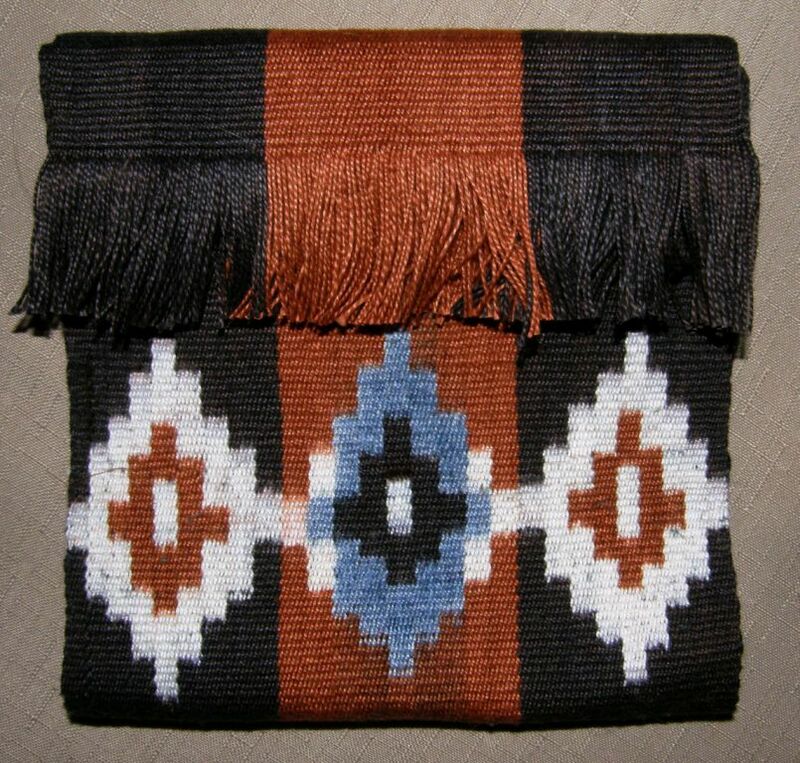 This is an example of the looped bags that the Ayoreo people make and this is a particularly fine example. A cooperative store in Santa Cruz sells these and you can often see the ladies sitting in the street making them. The quality of the work varies and I was pleased to be able to get this stunningly fine one. 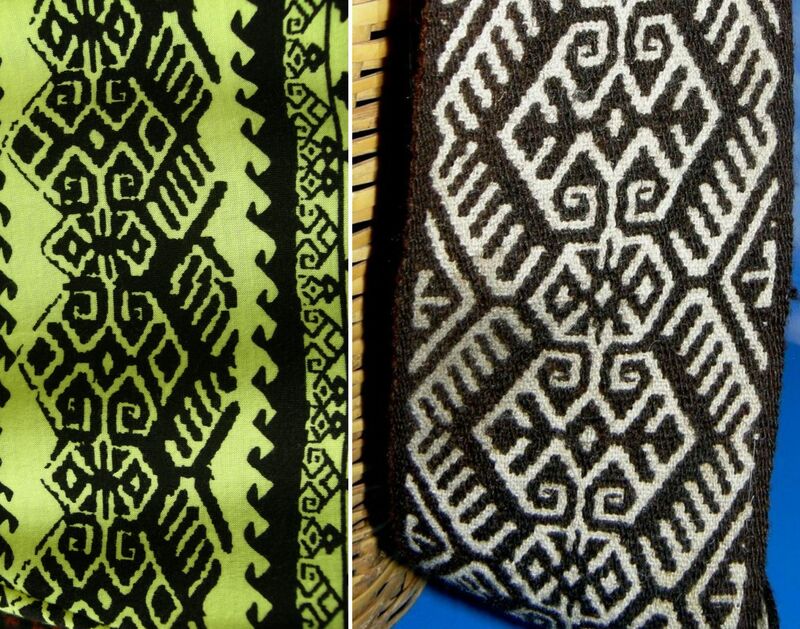 These placemats are woven in cotton by the Guaraní weavers. They, too, most often sell their products through the same cooperative store that is just one block from my home. As usual, the motifs they choose represent the abundance of vegetation and flowers in this jungly lowland area. First stop is Santa Cruz, California staying with my sash weaver friend, Annie for some pebble weaving. Loop braider Ingrid Crickmore was up to midnight putting her newly acquired pebble weave skills into practice. Above you can see one of her bands on the left. We practiced drawing pebble weave designs from fabric directly onto charts and then weaving them and Ingrid took advantage of that skill to weave the two designs you can see above. On the right you can see Annie’s tubular band on which she did a beautiful job. Later we practiced weaving and sewing a tubular band onto the edge of fabric. What was fun was that many of the guys in this group also braid with Ingrid and are avid loop braiders. They couldn’t resist finishing their bands with fancy looped braids. Below you can see Ingrid braiding away. You might notice that she even has loops on her thumbs!! Some people like to stand and backstrap weave, like Anne above, while others prefer to be down low on the floor like Sawyer…some do a little of everything. Some people put down their looms and take a walk and stretch while others simply change position so they can just keep on weaving. Annie looks completely engaged and comfortable sitting at her loom. Annie wears a different hand woven item everyday, usually a huipil or part of a huipil from Guatemala. This is a group that has woven with me on three occasions and we know each other better than most groups. Most only see each other when they come to weave with me so, there is a lot of chat and catching up to do! But there’s nothing like pick-up weaving to create pin drop silence while everyone settles in to concentrate. There’s Yonat above left, who usually has us rolling on the floor laughing, in a rare moment of quiet concentration. She picks up things so quickly! I expect to see her Facebook page covered in tubular bands soon. You can see that even the dog has enough sense to keep quiet while everyone concentrates. On the right Sawyer is sitting up off the floor to get stuck into her first tubular band. We wove, as we always do, in the Martha’s studio and, as usual, she brought out some of the beautiful pieces from her collection to show us while we ate lunch. Yonat also brings us some of her latest acquisitions and those pieces are the ”beautiful” part of this blog post. But first, let me take a little detour at this point to show you some the “bizarre’ things that I mention in this post’s title…. Annie took me on a trip downtown to a clothing store to show me how “ethnic” and “tribal” seem to be the current themes in fashion. We had a lot of fun digging through the store and pulling out items of clothing and home furnishing trying to identify the weaving culture on which the designs had been based. But other things were, quite frankly, “bizarre”!…. 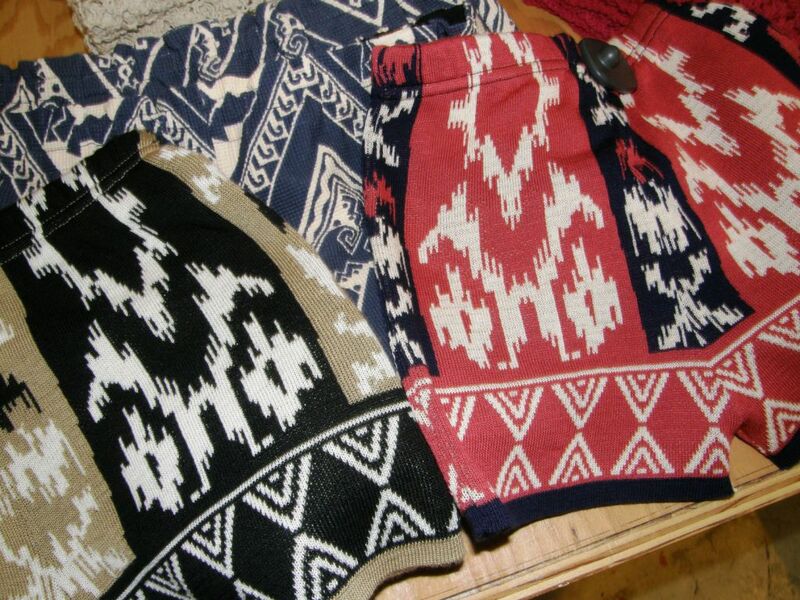 …like these tiny stretch knit shorts with their designs that imitate ikat. Can you see yourself in a pair of those? This pillow imitates the patterns that are woven with supplementary wefts in some areas of Guatemala. Certain towns are known for these large multicolored flower motifs on black backgrounds. On the pillow cover above, it seems that they have taken an image and enlarged it so that it has become pixelated and then printed that. In many areas in Guatemala the backs of these fabrics will have all the ends of the supplementary wefts hanging out in colorful chaos but it is never seen as it is on the inside of the garment. The creators of this pillow fabric, however, have tried to imitate that by attaching fabrics ends to the back face of the pillow….it is not hidden on the inside of the cushion but rather facing out on the back side! Bizarre! 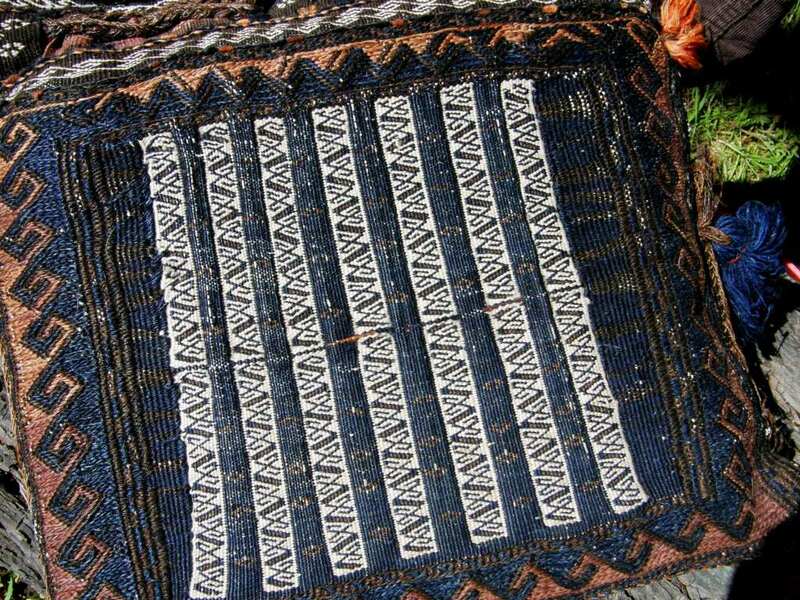 Those loose ends are not part of the textile structure at all but have been added on purpose to mimic the original ethnic fabric. Admittedly some of the fabrics were not quite so bizarre and were, in fact, very pretty but had obviously been fashioned into garments for people way way younger than myself. The mini skirt fabric is reminiscent of Central Asian ikat and I just might have worn something like that twenty five years ago! But this was the one that brought the biggest smile to my face…. 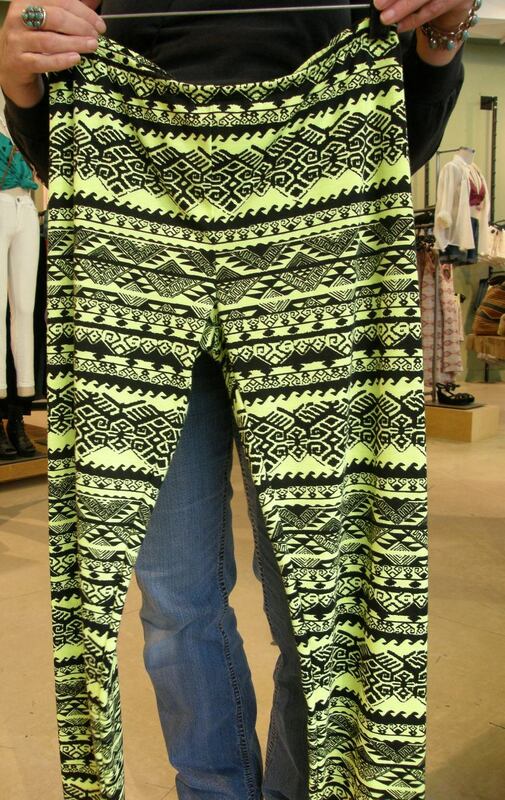 Back in my ”ski bum” days I would have been perfectly happy prancing around in these leggings. Lime green and black and neon pinks were the colors we sought in those times, but apart from the colors, one of the printed designs in particular caught my eye. 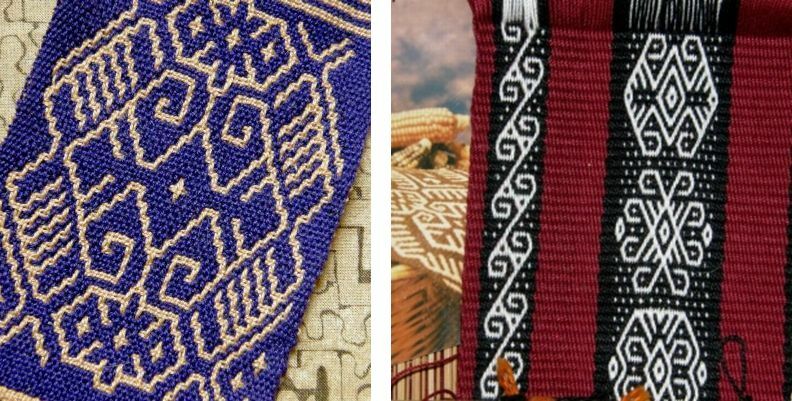 It is a motif with which I have been very familiar after having photographed it on a Huichol belt in the National Museum of the American Indian in DC in 2007. Those of you who have been following my blog may even remember this motif from several of my posts. It was very bizarre seeing this motif on these wild leggings. I can imagine the designers going off to the museum and taking pictures or making sketches from all the beautiful pieces there or maybe they only need to do a search on the internet these days. 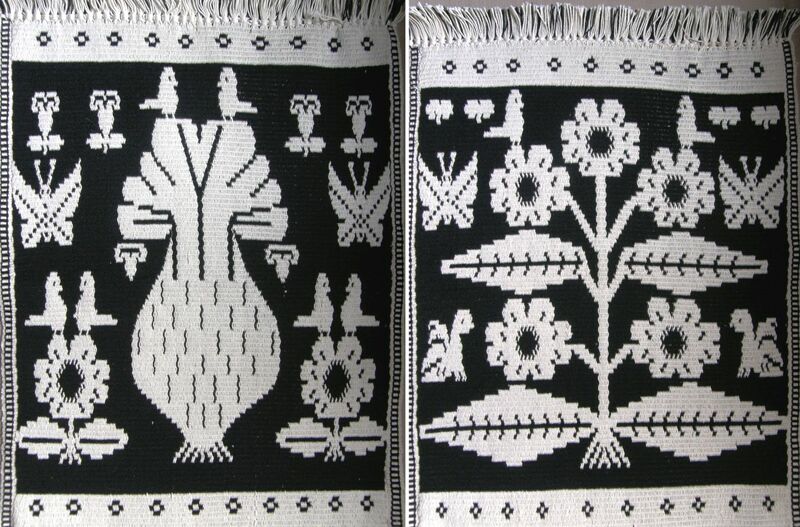 I tried to reproduce the design when I learned how to do balanced double weave and I also translated elements of the main motif to pebble weave. Now, I can even wear the motif on lime green and black leggings if I am so inclined! From there, let’s go to the beautiful textiles that I refer to in the title of this post and the new technique that I am itching to try. 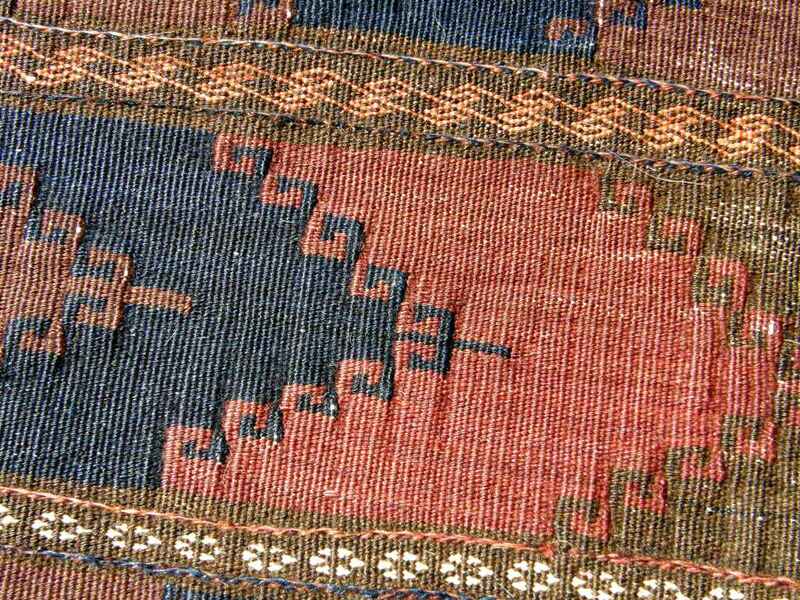 I have seen and heard about textiles made in the weft substitution technique but have not been tempted to try it because of the long floats that are created on the back of the fabric. Marla Mallett writes about it on her website and in her book Woven Structures. Of course it is a different story when you are actually touching and holding the fabrics in your hands. The designs that I saw in these structures were ones that did not actually create exceedingly long and cumbersome floats. They were not like the Bedouin motifs in warp substitution which result in what many consider long ugly floats. 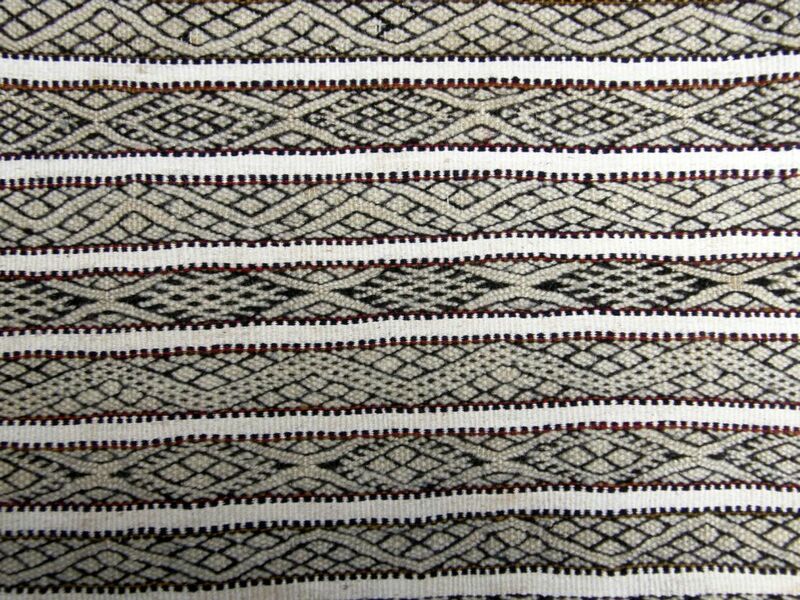 I could show you image after image of the rows of the weft substitution patterns on this gorgeous rug. Only a few of them are repeated and this is what has me looking for white and black wool (which pretty much doesn’t exist where I live in Bolivia) so I can go home and play with this technique. The rows of alternating red and mustard between the motifs really set off the patterns. The back of the rug is covered in tufts of wool which didn’t seem to have anything to do with the woven structure. It seemed that these tufts were added to give the rug a more plush feel on the floor. You can see between the tufts that the floats created by the weft substitution technique are not very long. There was one small row of countered weft twining along the bottom. Weft twining always catches my eye. And here’s the whole rug….beautiful! 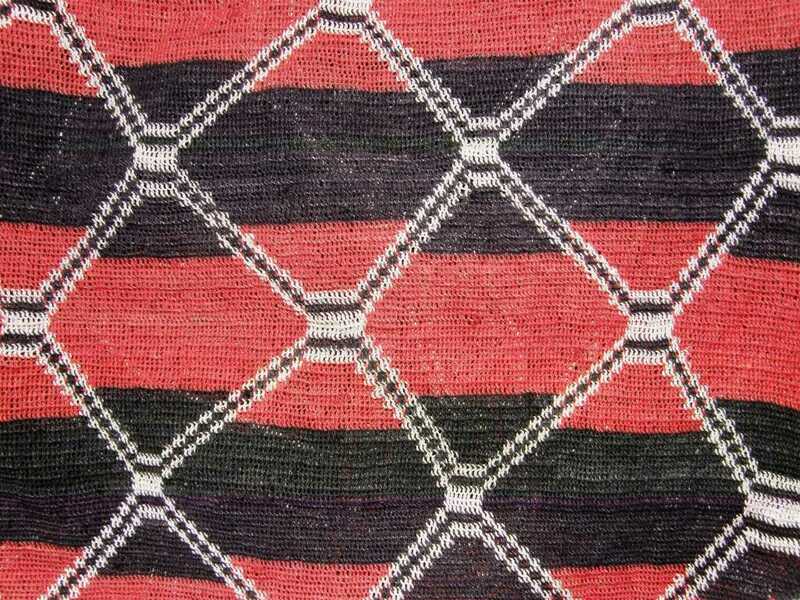 One day, Martha brought out a couple of bags in her collection which also show this weft substitution technique from Baluchistan (I had to run to Wikipedia to find out where that is having never heard of it before). She did not know that we had been admiring the Moroccan rug which had the same patterning technique and it so it was pure luck that I was able to have yet another chance to see fabric decorated with this technique. Baluchistan includes parts of southeastern Iran, southwestern Afghanistan and western Pakistan and is home to the Balochi people. 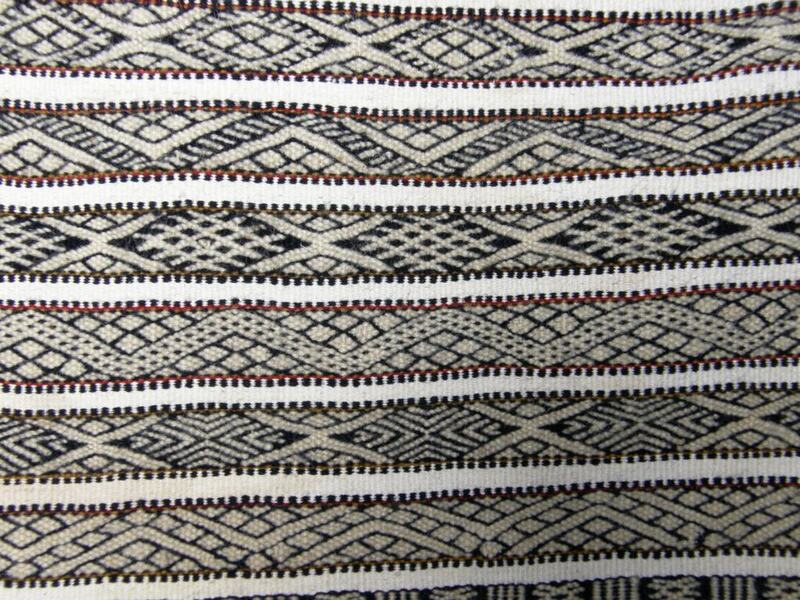 Above you can the motif woven with supplementary weft, in double weave, pebble weave and supplementary warp. 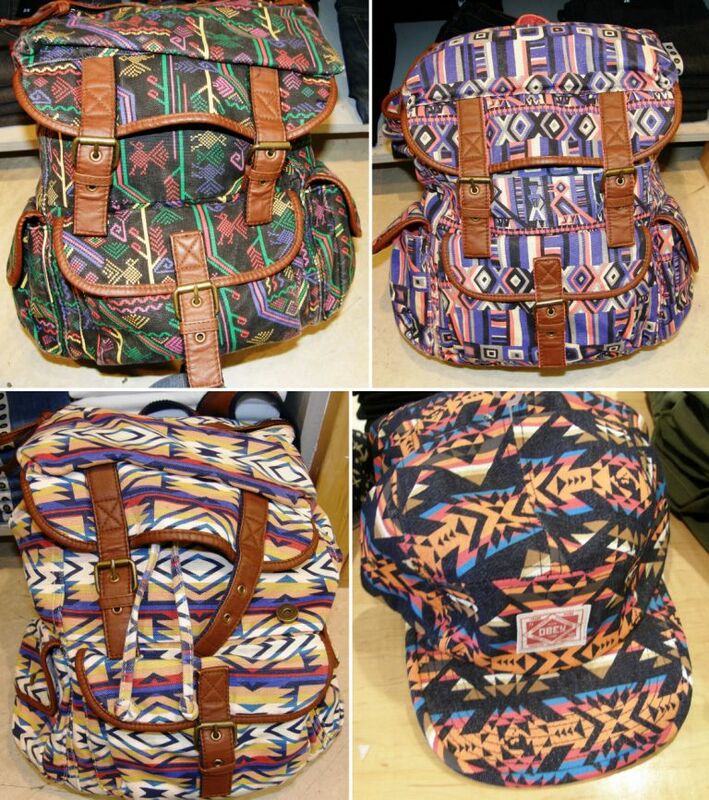 Above is the other side of the bag and below are a few details on this and other pieces that Martha brought out for us…. The closure system on this bag was particularly fascinating and I neglected to photograph it! 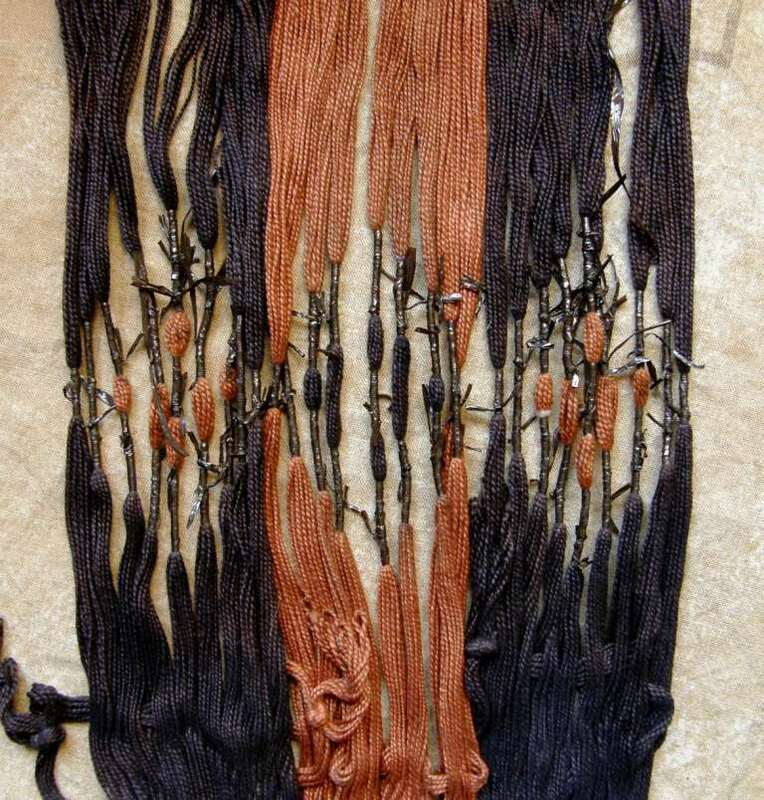 It comprised a series of slits through which goat hair loops were passed. Each loop passed through the previous one to create a chain…a little tedious to close the bag but to open the bag you would only have to pull on one end to have all the loops pop open. Someone said that they have seen similar closure systems on canvas tents so some of you may know what I am trying to describe. The weft-faced stripe patterns on each end of the rug would look right at home in a warp-faced band. And there are walls of colorful sashes to admire. I am struggling to find the time to take them down to examine and photograph before I leave for Oregon on the train tonight. I also have a pile of books that I borrowed from the guild library to peruse. As for Oregon, I have told my friends up there to hold the rain, please! I am excited about the prospect of a mini Ravelry meet up while there in Portland. 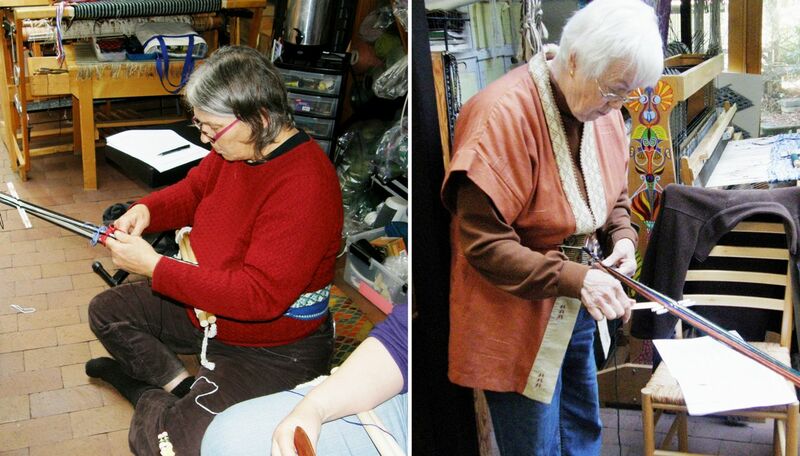 Two members of the Ravelry Backstrap Weaving Group will be coming to spend a couple of days weaving with me. Jennifer and Bobbie have been very active members of the Ravelry group for a long time and I have shown many of their projects here. I am looking forward to seeing first hand Bobbie’s latest piece where she is using fine naturally dyed Guatemalan cotton. I showed a few pictures of that a few weeks ago so we will be able to get an update. 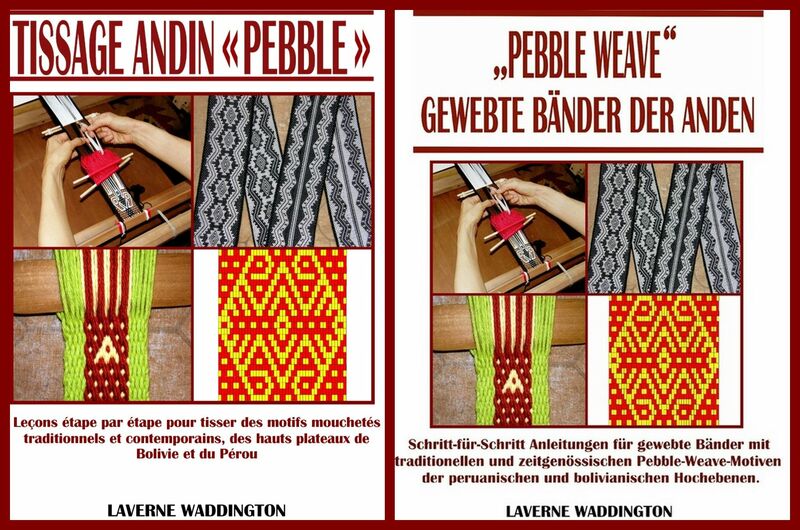 Pantoffels, also in the Ravelry group, recently adapted the techniques I teach in my Andean Pebble Weave book to her inkle loom. She is planning to sew the pieces of her band side by side into a wide piece. It looks great. I am always happy to see this on inkle looms as it opens up the technique to those who are just not into being attached to a backstrap loom. 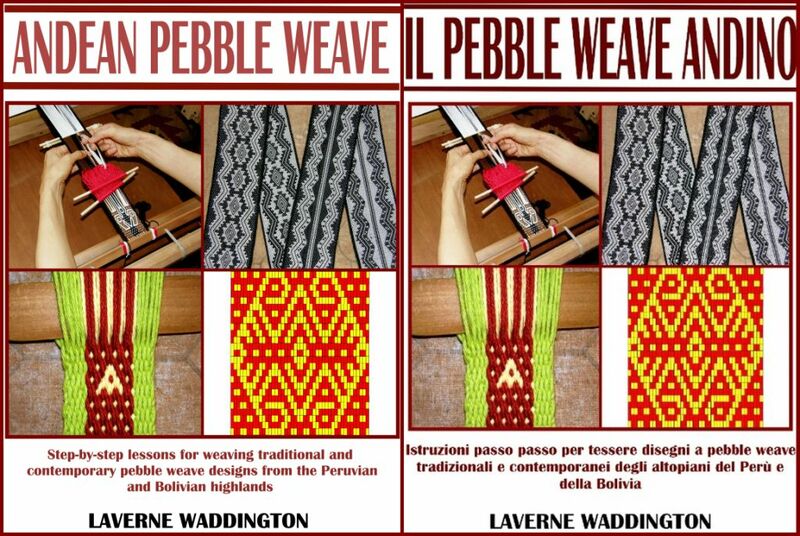 My book is now available as a download in four languages on Patternfish if Pantoffels has inspired you to try pebble weave too. 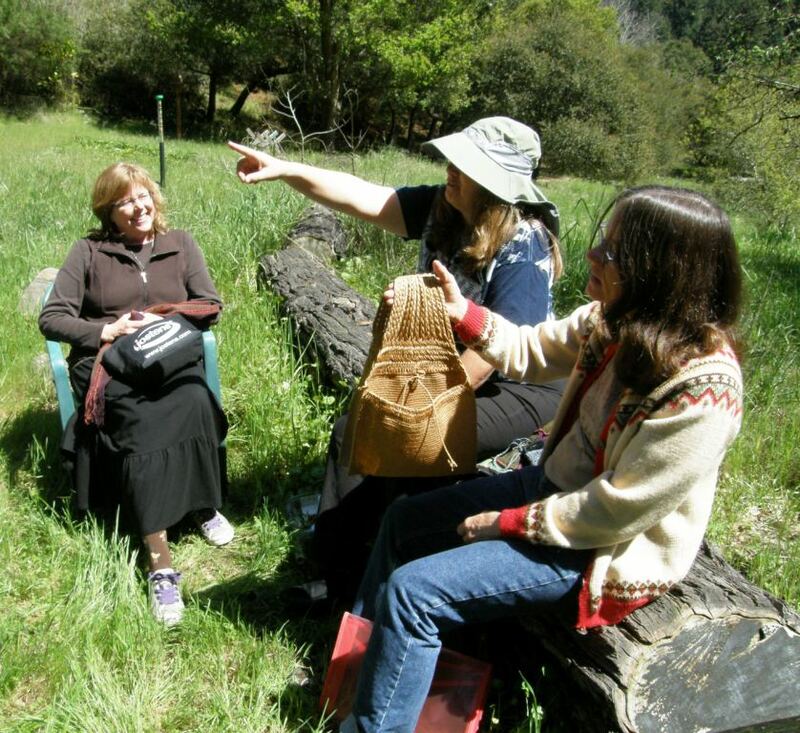 See you next time in Oregon…..
« Backstrap Weaving – Long, flowing, luxurious….sashes. Such talented people you weave with! Their bands are gorgeous! I saw lots of snow on the train trip up. The mountain scenery was gorgeous. Oregon is looking quite soggy! I think I prefer snow to rain. See you soon. Such gorgeous, inspiring photos! Thank you, Laverne! Hola Laverne, bonito viaje estás haciendo! Siempre muy interesantes y entretenidos tus comentarios, gracias por ello. Mencionas una Cooperativa en Santa Cruz donde se puede comprar trabajos de los Ayoreo. Me gustaría saber como se llama esta cooperativay dónde se encuentra pues una gran amiga viajará a Santa Cruz y creo que estará encantada de visitart esta tienda. Hola Luz. La tienda se llama ArteCampo y esta en la calle Monsenor Ignacio Salvatierra en la ciudad de Santa Cruz. Tu amiga solamente tiene que preguntar por “La Mansion” la cual es un edificio muy conocido en la ciudad. ArteCampo esta al lado de La Mansion. Hay trabajos hechos por la gente Ayoreo y un monton de otros objetos bonitos! Love the pictures! You have such an eye for color and interesting images. Your ikat looks superb, I think the crosses are as unfuzzy as an ikat gets. 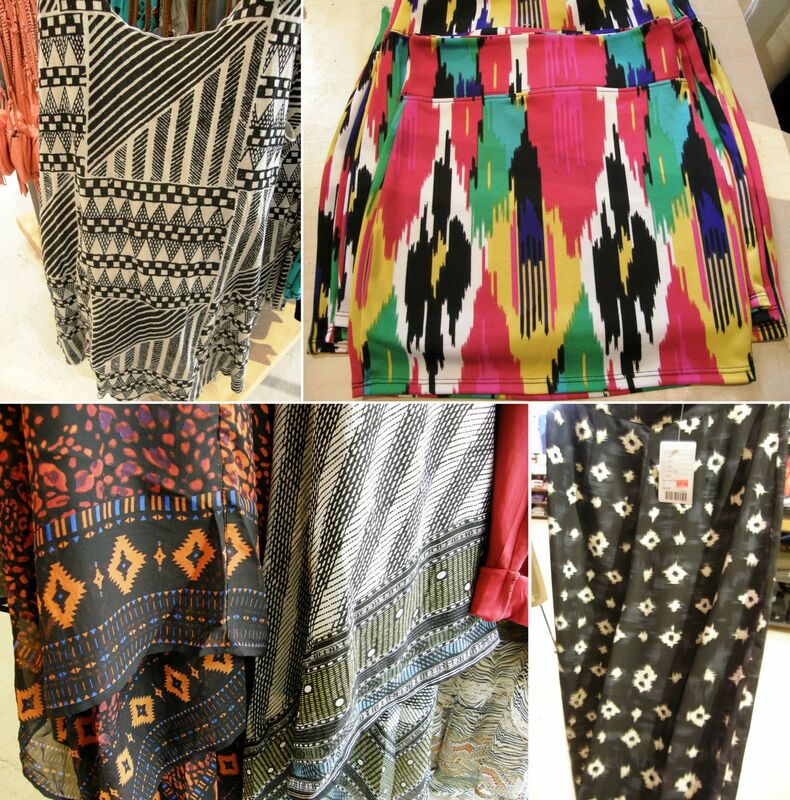 No I didn’t buy the leggings, Anna…maybe if I lived in colder weather! Like all the wonderful textiles that I see in my travels, I resist and am content with pictures. 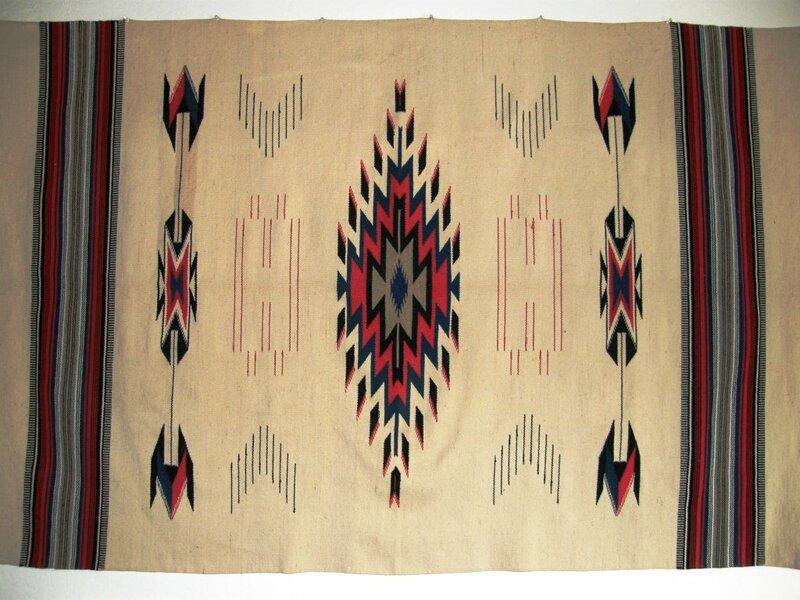 Thanks for the comment on the ikat. I can’t wait to try the next step in the ikat experiments. What a visual feast when you put all of these patterns together in one post! 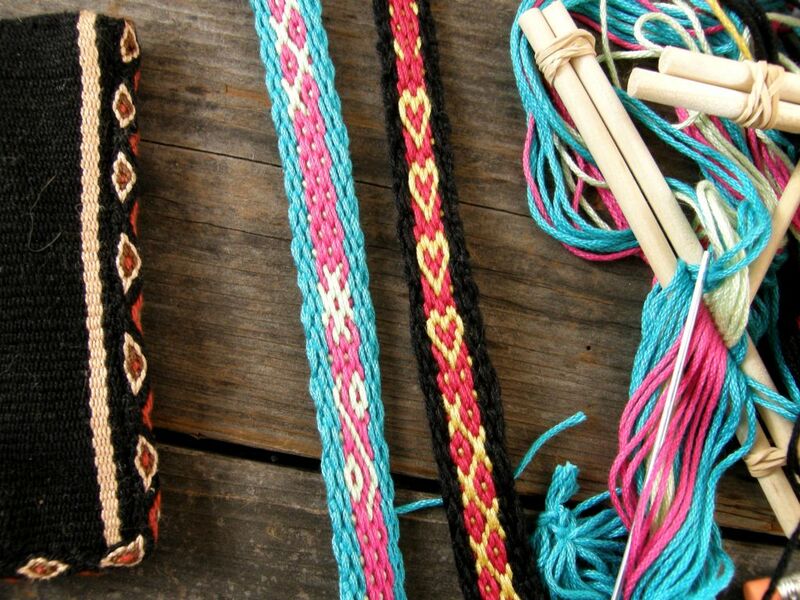 I was one of the lucky ones to weave with you. So much to weave and so little time! How nice it is to have friends who connect the past to the present without dropping a stitch in time. 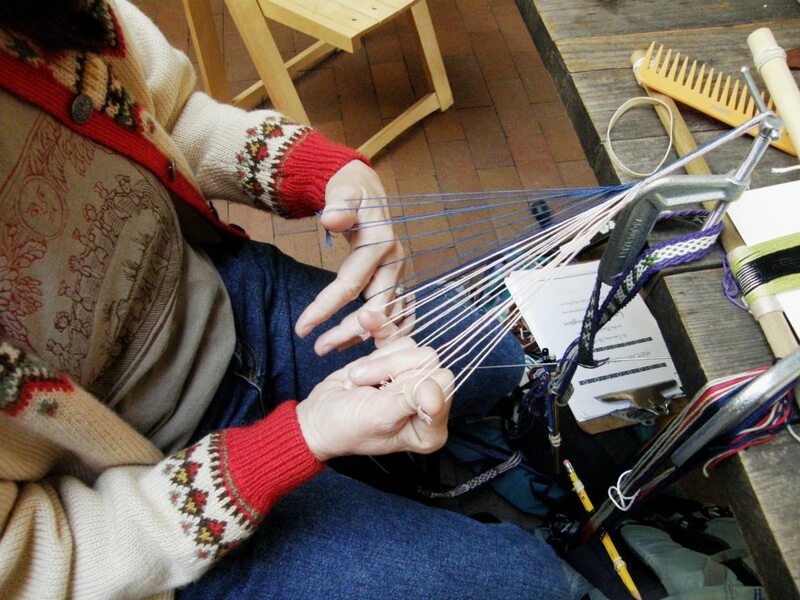 Hi Anne, I love weaving with all of you and look forward to doing it yet again some time. Nice to see you as a regular visitor Betsy and thank you for your comments. Laverne, Your site is pure magic, thanks a lot for all these amazing inspiration on weaving and lots of new techniques to learn! Here in Sweden we use a technique similar to the simple warpfloats, and back strap. We use a kind of fixed heddles called “bandgrind” in back strap weaving here. 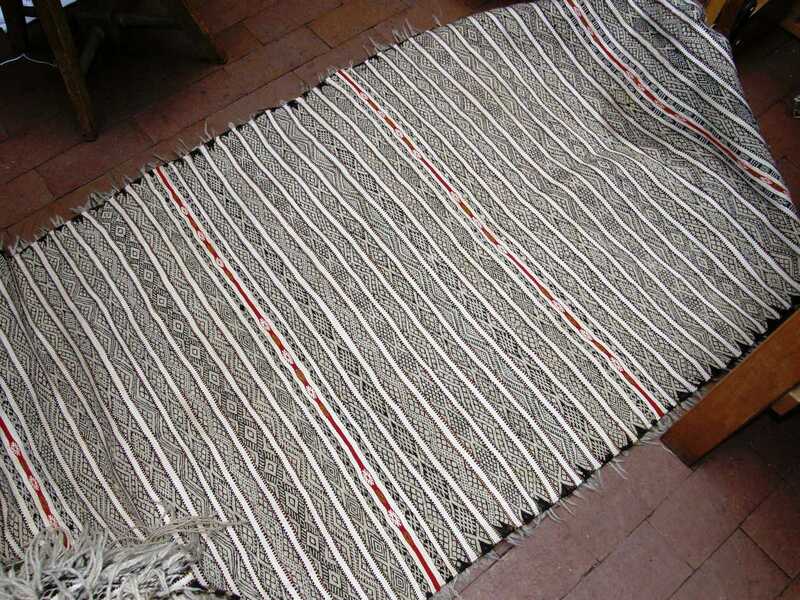 Tablet weaving is also common. I have a book om Guatemalean back strap weaving, but it is only on brocade weaving. So I find Your tutorials most exiteing! Thank you Camilla! 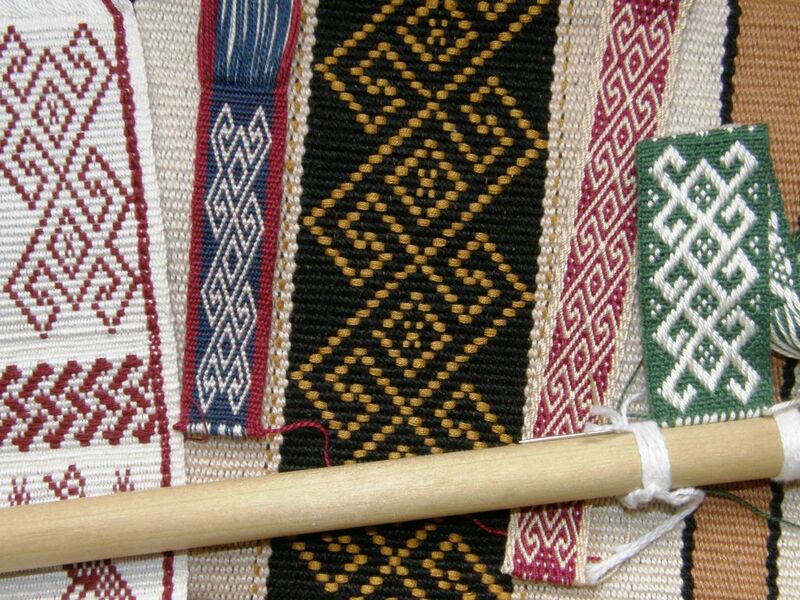 I have been lucky to have been able to see some Swedish-style band looms in the various online groups in which I participate and the bands are beautiful. 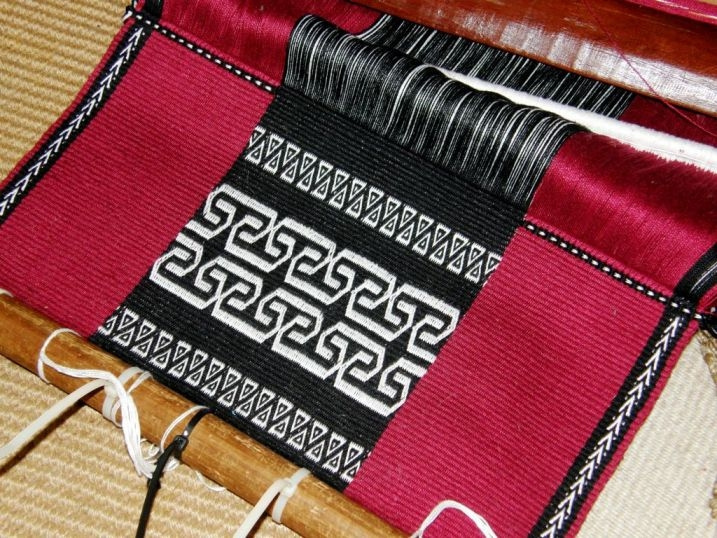 Some of the rigid heddles are so beautifully carved and decorated. I hope you will try some of my tutorials here. Happy weaving. Laverne, this weekend I made a band with simple warpfloats and some patterns I draw with flowers and birds. I have now found the sticks I made for backstrap weaving some years ago, but never came to use in any wider extent back then. I found it difficult and bought a small table loom instead and also learned how to weave eith tablets. Now I am glad I still have all the sticks and look forward to try your tutorials, they are very nice and easy to understand! Camilla, I was able to photograph a lovely Mexican bag with motifs in simple warp floats this last weekend. I will show it in this week’s blog post so you can have some more patterning ideas. And I totally think you could rock those leggings. I’m so glad you posted the Moroccan rug! I have a small one from Morocco, and I’ve had so many questions about how it’s made – this helps! And such a beautiful piece. I know you’ll crank out stunning interpretations as soon as you get home. I would love to see pictures of your Moroccan rug some time Tracy. BTW I saw your article in Spin Off today…beautiful!